Set in various Italian locations, this soapy romance might have been more appealing in colour. What it does have, however, are two likeable leads in Joseph Cotten and Joan Fontaine and Kurt Weill's September Song, sung by Walter Huston on the soundtrack. 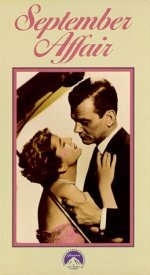 The contrived plot has Fontaine, a concert pianist (cue for some emotive Rachmaninoff), and wealthy married Cotton falling in love when they miss their plane back to the USA. The plane crashes and they are listed among the dead. Now they can start a new life together. Or can they? Thankfully William Dieterle's direction avoids oversentimentality.